Common Name: Wild indigo; rattleweed; horsefly weed. 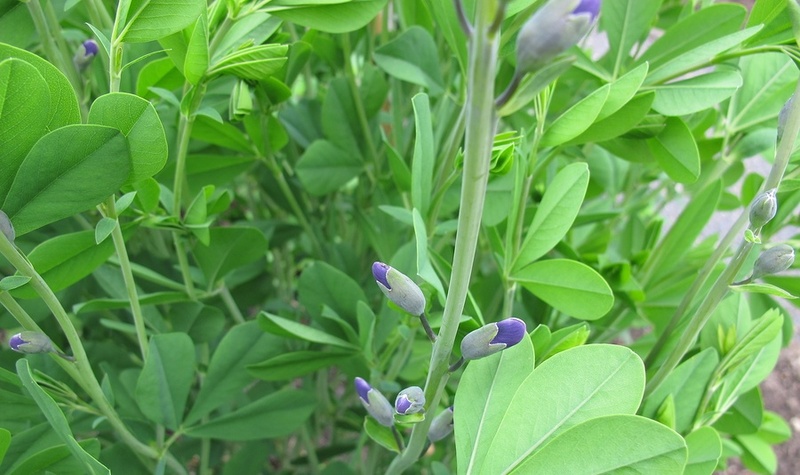 Traditionally, Baptisia has been a remedy for serious infections or sepsis. It has also been used for types of diphtheria, flu, and typhoid fever. The person needing it is drowsy and falls asleep while responding to questions but also restless from body aches and pains. Delirium and confusion may also be present. The mouth or discharges (stool, perspiration, urine) have a putrid odour and the face confused and dusky in colour. Baptisia may be used with conventional medicines, without interactive or toxic side-effects. Drowsiness to the point of coma. As if drunk, intoxicated, sleepy. May respond to questions but falls asleep mid-sentence or immediately on answering. Confused sensations and delusions about body – as if it is broken or double, separated or scattered, enlarged or twice its normal size, or limbs “talking” to each other. Ragged ulceration of tongue and throat. Painlessness of ulcerated, inflamed throat. Throat spasms – gagging on solid food but able to swallow liquids. Bruised and sore pains with muscles and joints. Unable to get comfortable in any position – bed feels too hard (c.f. Arn; Rhus-t; Pyrog.). Baptisia tinctorial (Bapt.) is available from our online store as a single remedy in either liquids or pills. For acute and self-limiting complaints, take one pill or five drops of the remedy every 1 hour to 4 hours (1 hour for intense symptoms, 4 hours for milder ones). Once an improvement is noticed, stop dosing and repeat the remedy only if symptoms return. If there is no improvement at all by three doses, choose a different remedy or seek professional guidance. Chronic symptoms or complaints require a course of professional treatment to manage the changes in potencies and remedies that will be required.